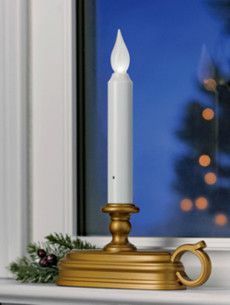 Every year, we hear the same frustrating stories regarding electrical window candles. They look great, but the maze of electric cords and the concern of them burning close to window curtains or being tipped over by children or pets can worry us through the holidays. Now, there is a realistic, bright, and high quality battery-operated window candle option that will not break the bank and eliminate the frustrations many of us experience with typical electric window candles. The Xodus brand LED window candles are really becoming quite popular and for good reason. They outperform the old fashion battery-operated candle lamps, because they are LED. LED lights use about 1/20th of the power that incandescent candle lamps do. As a result, you will not be replacing batteries every couple of days. Instead batteries last about 30-45 days! Even better yet, the window candles have a daylight sensor on them which makes them turn on automatically at dusk and off at dawn. No more running around before bed to turn them all off. And this photo-cell works great! I have owned these for 2 years now and they turn on right at sunset and off at sunrise – it is quite convenient! These candles are cool-to-touch, so you will not have to worry about them as a fire hazard. Once the batteries are installed in the base of the lights, they will stay put and do not topple over, which is a common frustration with electrical cords that tug and pull on plug-in candle lamps. Lastly, they have a great looking, soft white light. The color is more of a personal preference, but you will be happy with the look of these lights both from up-close and from far-away. The soft white light carries well to the street and blends well with clear string lights that you may decorate with outdoors during the holidays. These LED window candles from Xodus are the closest thing that we have found to electrical candles and they eliminate all the frustrations with setting up electrical candle lamps each year. Available in three styles and three colors. Stop by during the holidays and see our large display in-store!